Metallica have announced their final 2012 summer European tour date. 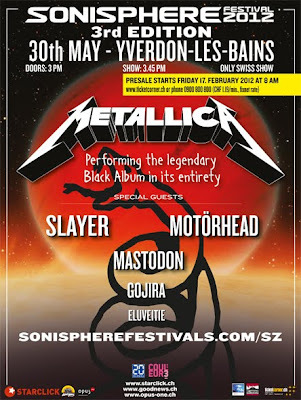 “This is it, our final addition to the summer vacation in Europe with a Sonisphere date at Yverdon-les-Bains, Switzerland on May 30, 2012. You guessed it, the 'Black Album' will be performed in its entirety (yeah, yeah, that 20th Anniversary thing) and the line-up for the day is out of this world as Slayer, Motorhead, Mastodon, Gojira, and Eluveitie will all be joining us! The Met Club pre-sale already in progress, so Clubbers should log in for details. The pre-sale will end on Wednesday, February 15 at 9:00 AM local time. There is a four ticket limit for the pre-sale. Tickets go on sale on Friday, February 17 at 8:00 AM local time at www.ticketcorner.ch. 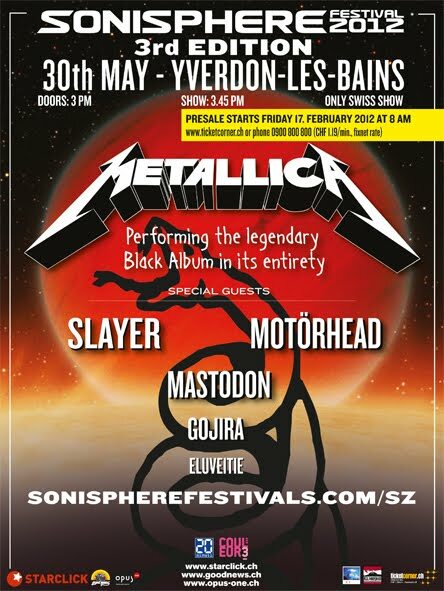 For more information about Sonisphere, click here: www.sonispherefestivals.com. The Metallica European tour kicks off May 7 in Prague and wraps June 10 in Nickelsdorf, Austria…..following that, the band headline their own Orion Music + More Festival for two dates in Atlantic City June 23 and 24. For more details on Orion Music + More, click here.